Last updated: Mar 11, 2019 . Do you know that an estimated 165.8 million people shopped between Thanksgiving Day and Cyber Monday in 2018, and that each person spent an average of $313 during this period? Or that the average holiday shopper purchased 16 gifts during the 2018 holiday season? The holiday season is huge, particularly for shoppers in the United States, and it often accounts for as much as 30 percent of some retailers total sale for the year. Based on analysis of data from over a dozen different authoritative sources, including Experian, Deloitte, and the National Retail Foundation, this article contains all the statistics you need to know for the 2019 holiday season. Holiday retail sales crossed the $1 trillion mark for the first time in 2018. The average American shopper spent $846 on gifts in 2018 — a 14 percent increase from 2017. 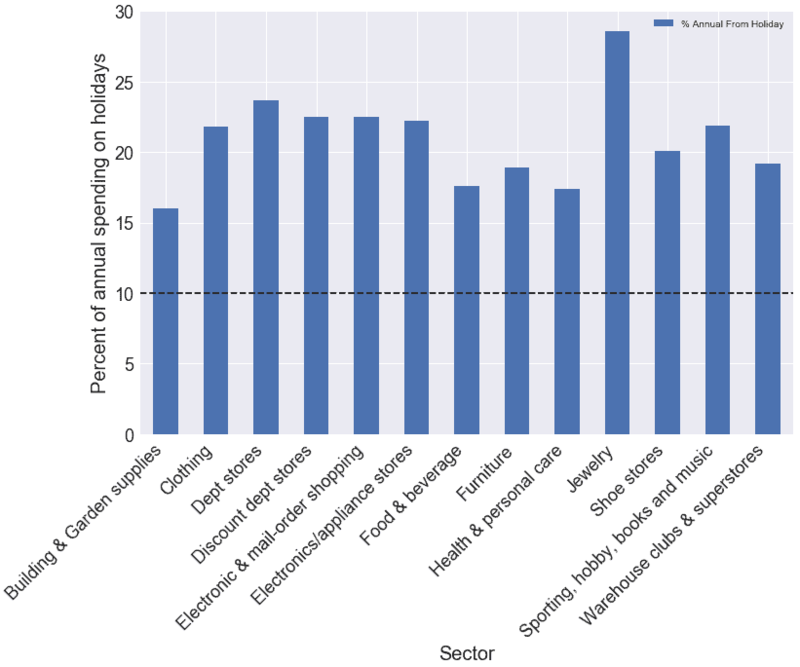 The average holiday shopper purchased about 16 gifts in 2018. Holiday ecommerce sales was responsible for $126 billion in 2018 — a 16.5 percent increase from the $108.2 billion generated in 2017. More than half (56 percent) of people who shop during the Thanksgiving period believe the best deals of the season are available on Black Friday. Clothing and accessories, electronics, and toys are the top items people shop for during the Thanksgiving period. Black Friday is the busiest traffic day of the year. In 2018, Cyber Monday generated $7.9 billion in online sales — making it the biggest sales day in US ecommerce history. Cyber Monday is the largest online shopping day of the year — with 47 percent of all online spend during the Thanksgiving period expected to occur on Cyber Monday. About 40 percent of all holiday sales in the US takes place on Amazon. Direct website traffic is the biggest driver of holiday sales at 25.3 percent. This is followed by paid search (25.1 percent) and email (24 percent). 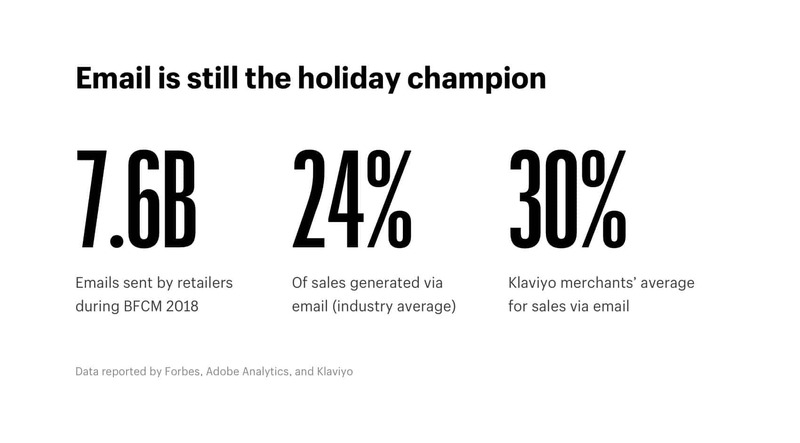 Email was responsible for 24 percent of sales during the 2018 Thanksgiving holiday period. The holiday season accounts for 20 percent of the retail industry’s annual sales, and it is often responsible for up to 30 percent of some individual retailers’ total sale. 48 percent of online shoppers will do the majority of their shopping on or before Cyber Monday. Almost 25 percent of all personal spending in the United States takes place during the holiday season. An estimated 40 percent of 2018’s holiday digital revenue came in during Cyber Week (the week starting the Tuesday before Thanksgiving and ending on Cyber Monday). In most retail sectors, over 20 percent of annual spending takes place during the holiday season. Holiday sales grew 2.9 percent in 2018 — taking 2018 holiday sales to $707.5 billion from $687.9 billion in 2017. This was lower than the up to 4.8 percent growth projected by the National Retail Federation. More than 40 percent of holiday shoppers start shopping before Halloween. Holiday foot traffic to brick-and-mortar stores continues to declining — declining by 7.5 percent in November and December 2017 — due to the growing trend towards ecommerce. Black Friday and Thanksgiving searches and sales peak at 8 PM. 73 percent more people used Instagram to track deals during the 2018 holiday season compared to 2017. 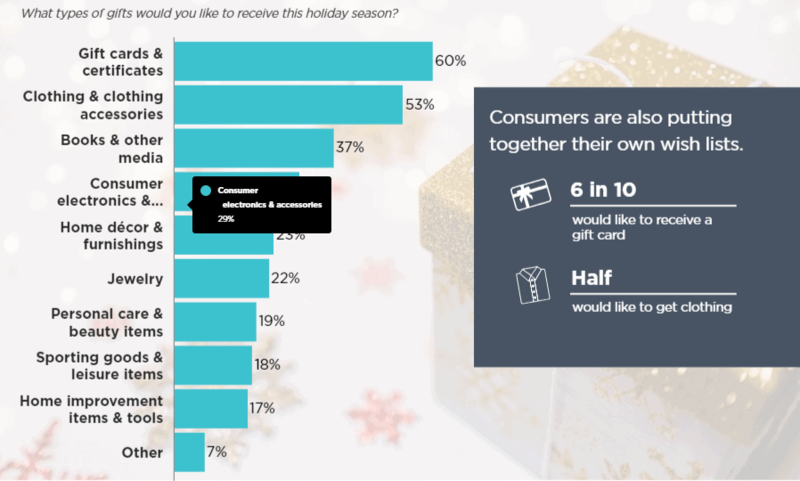 4 in 10 people will start their holiday shopping by November 1. 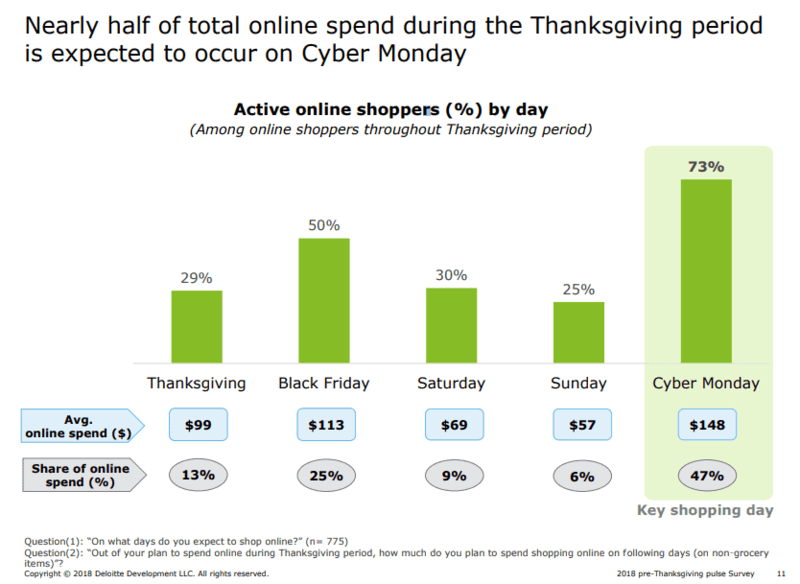 55 percent of all holiday purchases will take place online. Sales and price discount is the most important factor for most shoppers when deciding where to shop during the holiday season — with 71 percent of shoppers preferring it to every other factor. The majority of people (47 percent) of people get inspiration on what to give during the holiday season online. This is followed by ideas from family and friends (41 percent). An estimated 165.8 million people shopped between Thanksgiving Day and Cyber Monday in 2018 — with each person spending an average of $313 during this period. 61 percent of holiday shoppers will buy their last gift in the week leading up to December 25. 65 percent of people’s holiday purchases are influenced by sales and promotions. There was a rise in multichannel shopping during the 2018 holiday season — with 54 percent of shoppers browsing and buying both online and in stores over. Multichannel shoppers spent more during the 2018 holiday season ($326 on average) compared to online only shoppers ($233 on average) and in store only shoppers ($248) on average. 49 percent of what holiday shoppers purchase is influenced by the retailer. 77 percent of holiday shoppers will purchase from the same retailers as they did last year. 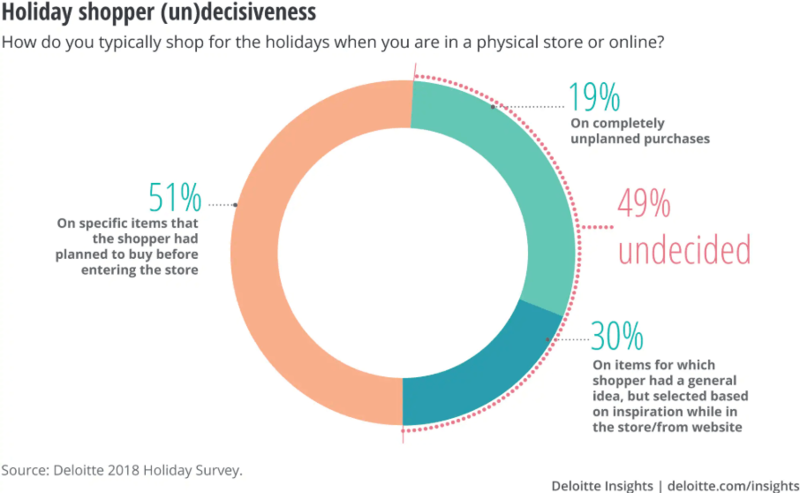 While holiday shoppers are mostly loyal to retailers they shop from, up to 75 percent of shoppers are willing to try other retailers if given the right incentives — these incentives include better prices, greater product selection, and unique offerings. For 95 percent of holiday shoppers, being given price discounts is the most effective way to get them to shop with a new retailer. The most desired holiday gift is a gift card — with 60 percent of people preferring it to other holiday gifts. Yet, most shoppers (59 percent) would rather gift clothing and accessories, while gift cards comes second at 56 percent. 23 percent of shoppers plan to use social media to help with their holiday shopping process. More people shop online (91 percent) than in-store (89 percent) during the holiday season. For those who shop in-store, the majority (82 percent) do so because of the deals. Only 16 percent of social media users trust celebrity recommendations for their holiday shopping. Most people pay for their holiday purchases using a credit card (46 percent). This is followed by a debit card (36 percent) and cash (16 percent). Mobile ecommerce sales increased by 32.6 percent in 2018 — accounting for 44 percent of all holiday ecommerce sales. Mobile devices were responsible for 54.3 percent of all visits to retail sites on Cyber Monday 2018, compared to 34.7 percent of visits from desktops. Smartphones were also responsible for 42.6 percent of sales. 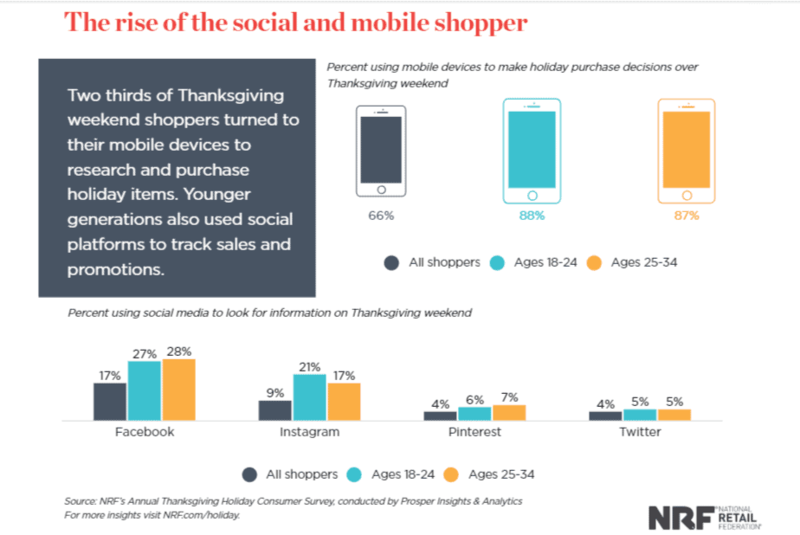 66 percent of shoppers used their mobile device to make purchase decisions over the 2018 Thanksgiving holiday period. 76 percent of mobile holiday shoppers change their mind about which retailer to shop from after searching online. Mobile devices drove an estimated 72 percent of all traffic and 54 percent of all orders on Christmas Eve 2018. 71 percent of people will use their mobile device to research or make a purchase during the holiday season. 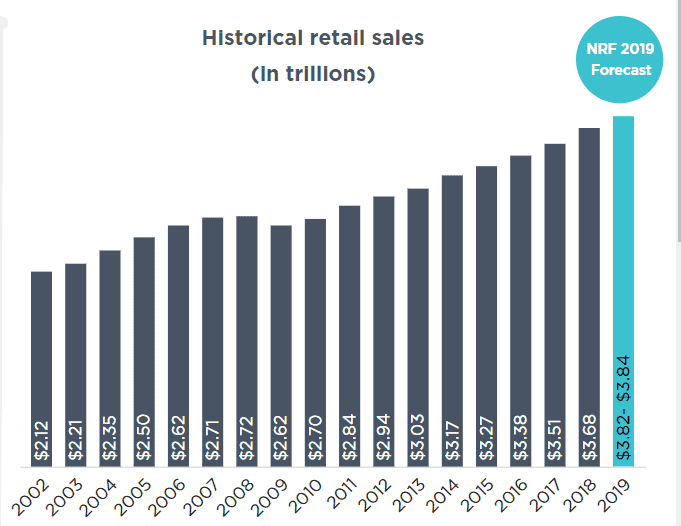 2019 retail sales is projected to increase up to 4.4 percent to more than $3.84 trillion. 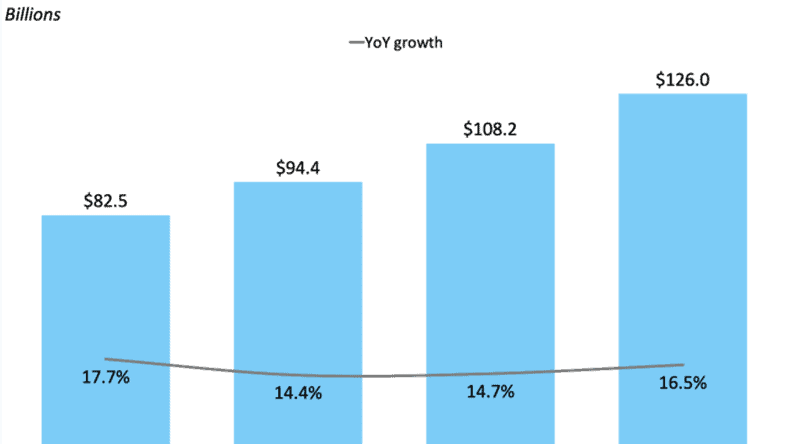 2019 online sales is expected to grow up to 12 percent to $764.8 billion. 75 percent of shoppers expect free delivery on their online orders. 65 percent of people consider shipping costs before adding an order to their shopping carts — with many making sure not to exceed the free-shipping thresholds. 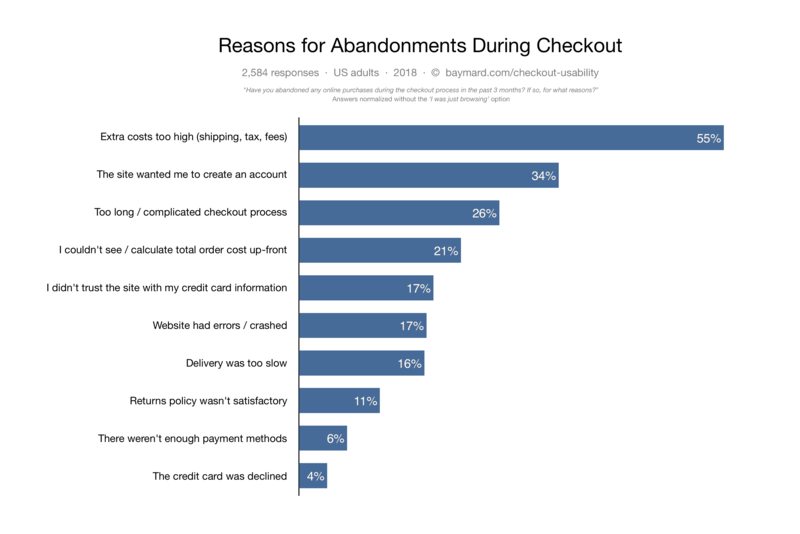 The average online shopping cart abandonment rate is 69.89 percent. 55 percent of people abandon shopping carts due to high extra costs such as shipping rates, fees, and taxes. Most ecommerce purchases take place on Mondays, followed by Sundays. Most ecommerce sales take place between the hours of 8 PM to 9 PM. More than half of shoppers are unwilling to share personal information other than their names and gender information. If given promotions, discounts and other offers, however, 61 percent of people will share personal information.